The Vrhovine Municipality Tourist Board is a local self-government unit, under the special state concern, located within the Lika-Senj County. It covers an area of 224 km2, which is 4.18% of the total area of the Lika-Senj County. With its total of 8 settlements, the Municipality is in the sixth place by size within the Lika-Senj County. The basic characteristic of the relief features the Mala Kapela in the northeast with its peak of Seliški vrh 1,279m asl. The ranges of the Mala Kapela descend towards the Vrhovinsko polje. Other peaks on the territory of the Vrhovine Municipality include Krivi javor (1,204m asl), Ciljak (1,018m asl), Cigelj (1,164m asl) and Brda (1,006m asl). Amidst these peaks, the terrain is highly indented with lush and separate valleys. To the south of Vrhovine, there is the peak of Panos (974m asl). The whole area of the Lika region including Vrhovine belongs to the karst area. These karst features are recognized by rocky cracks (dry or spring), slopes, pits, abysses, caves, larger and smaller rocks and karst fields such as Vrhovinsko polje and Gacko polje. Hydrological characteristics reflect the geological features of the whole region. Here, underground waters are much more dominant than the spring ones which have not been yet fully explored. The subterranean of the karst area is characterized by secondary rock porosity. Due to the thin and insufficiently efficient surface protective layer, the merging of surface and underground waters occurs easily, thus soil dirt can reach the underground waters, which is the reason why these areas are environmentally sensitive. Considering geological features and seismic activity of the region, the Municipality of Vrhovine is classified to the zone VI of the Mercalli–Cancani–Sieberg (MCS) scale. The climate of the Municipality of Vrhovine is mountainous, with some features of continental climate in the lowland part. Summers are short and dry, while winters are cold with lots of snow. The lowest average monthly temperatures are registered in January, February and December, and the average annual temperature is slightly higher than 8˚C (in mountain ranges 4 – 6˚C). The highest temperature rise occurs between April and May, while the largest drop in temperature is in the period between October and November. Absolute extremes of air temperature express the continental climate. The highest maximum is in July and August (up to 36.5˚C), and the minimums are in January (up to -21.1˚C). The annual maximum and minimum temperature differences range between 29 – 45˚C. 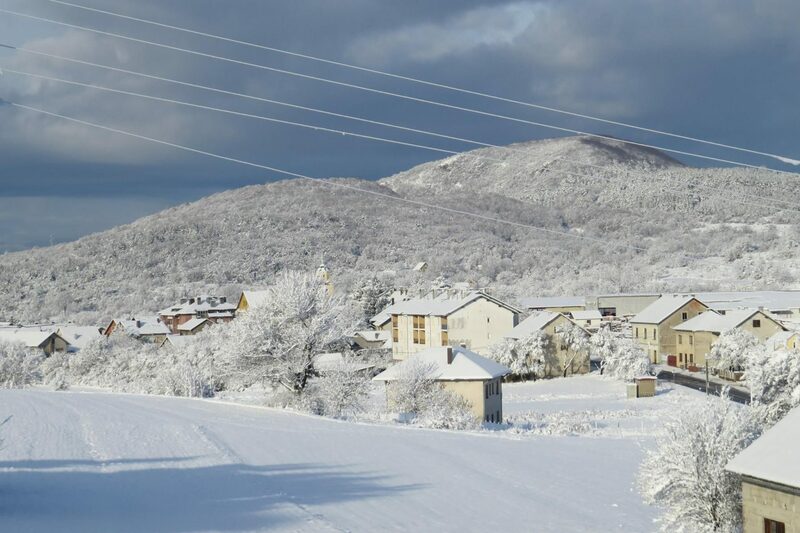 The average number of snow days with more than 1 cm of snow is registered in Vrhovlje for 30 to 80 days a year (usually from November to April). The maximum height of snow ranges from 80 to 150 cm, and in 1980 the snow height of 286 cm was registered in the mountainous region of the Municipality of Vrhovine. Snow cover in higher areas lasts longer (20 – 70 days a year), and in the lower areas is shorter (ten days in thickness of 30 cm and above). The highest prevalence of wind in Vrhovine comes from the northwest (30%) and north (16%). The western (5%) and east winds blow at minimum (4%). Approximately 15% of the days are windless, while 60% of the windy days measure up to 2 boomers. The Municipality of Vrhovine is a political and territorial community in which 2,853 inhabitants lived in 1991, while today only 1,256 inhabitants live here according to the national statistic data. The Municipality of Vrhovine includes the following settlements: Gornje Vrhovine, Dugi Dol, Rudopolje, Turjanski, Vrhovine, Zalužnica, Donji and Gornji Babin Potok. The long-term development of the Municipality of Vrhovine cannot be grounded on the past period, thus it is to evolve in a completely new environment conditioned by the market and entrepreneurial management system. It must not only include elements of regular development of economic and social activities, but also the overall reconstruction process following war destructions and their consequences, which should be accelerated to as soon as possible normalize the economic, demographic and psychological conditions for a healthy economic and political environment. It is expected from the Municipality of Vrhovine to be capable for independent economic and social development, based on its own productive resources. Such a holistic approach is now only possible due to the many uncertainties present: the transition process, the speed and relative success of the reconstruction, the slow leaving of economic depression and the beginning of revival of economic activities, negative demographic trends and the need to adapt the existing capacities and subjective resources of the Municipality to the new market conditions. The Strategic Economic Development Planning Process started by the Municipal Council’s Decision to establish cooperation with the USAID and the Urban Institute’s Local Self-Government Reform Project (PRLS), as well as when economic development was selected and approved by the Municipal Council in 2003 as a priority model for the future development of the Municipality. 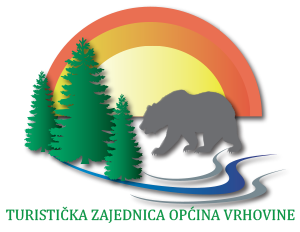 The Municipality of Vrhovine has established its Tourist Board which became operational on 19 May 2017. The newly founded Tourist Board has as its aim to give full contribution to the tourist and economic promotion of the Municipality of Vrhovine, located in the heart of the Lika region, as the prime tourist and economic destination, and to attract visitors from all over the world. We are strongly dedicated to assist the local community in its efforts to create strong foundations for better living conditions which will also foster and create better tourist standards of our municipality. To this purpose, we are fully committed to preserve the natural beauties of the unique landscape, as well as our rich cultural and traditional heritage. In addition to tourism and hospitality related businesses, the Municipality has great potential for other activities which are complimentary and beneficial for tourism such as agriculture and cattle breeding so as to strenghten and increase the number of family farms to grow fresh produce. This would prevent the demographic decline we are facing at present and create conditions for activities throughout the whole year which would help strenghten our local communities and increase their living standards and ultimately improve population growth. The Tourist Board will deploy all the resources available to foster sustainable tourist growth and development as the leading activity in the Municipality, which will further lead to the socio-economic growth and development of the Municipality as a whole.